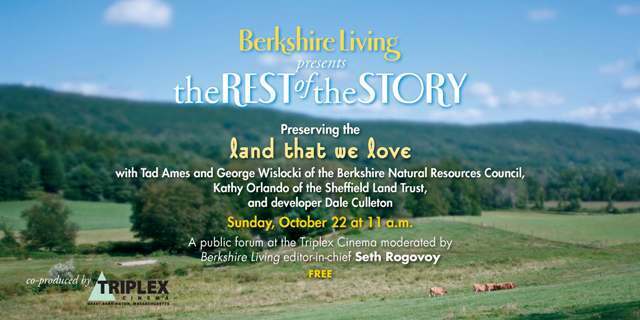 Preserving the Berkshires, a free public forum with leaders in land preservation and development efforts -- part of The Rest of the Story series moderated by Seth Rogovoy, editor-in-chief of Berkshire Living magazine, takes place on Sunday, October 22, at 11 a.m. at the Triplex Cinema, in Great Barrington, Mass. Guest panelists will include Tad Ames and George Wislocki of the Berkshire Natural Resources Council; Kathy Orlando of the Sheffield Land Trust; and green developer Dale Culleton. The free event will include discussion of ongoing efforts at preserving the Berkshire landscape; suggestions for how citizens can become involved; and discussion of the balance between the need for housing and development versus the importance of preserving the Berkshire landscape. There will be an ample question-and-answer session and discussion is encouraged. Each month, the Triplex and Berkshire Living, an award-winning regional lifestyle and culture magazine, join forces to present free public forums based on an article running in the concurrent issue of the magazine. The October cover story is "The Land Is Our Land: Preserving the Berkshires," written by Daniel Bellow and photographed by Kevin Sprague. For more information, call Berkshire Living at 413.528.3600. Seth, This initiative is great! May I make a couple of suggestions? George and most of us involved with the land trust movements have always said that the best way to save the land is to save the farms and the best way to save the farmers is to give them some $ through the APR program and to see that farming can be sustainable. Berkshire Grown has done the latter very successfully and I would suggest that you add a farmer and Danielle Mullen, ED of Berkshire Grown, to your panel.